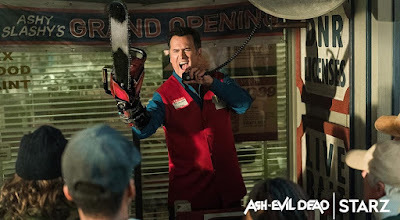 Bruce Campbell reprises his "Evil Dead" film role as heroic, chainsaw-handed monster fighter Ash Williams, now an aging lothario who has successfully avoided responsibility, maturity and heinous villains for the past 30 years. Constantly peering over his shoulder, Ash somehow knew that the Evil Dead would return for him. That day arrives when Ash commits an act of carelessness, unleashing a Deadite plague that threatens to destroy mankind. Co-starring in the half-hour series are Lucy Lawless as mysterious Ruby; Ray Santiago as Ash's loyal sidekick, Pablo Simon Bolivar; and Dana DeLorenzo as moody wild child Kelly Maxwell. The 10-episode third season of Ash vs. Evil Dead will premiere at 9 PM Sunday, February 25.